Dining in Marrakech is an experience pleasing the eye, pallet - and the wallet. All over town you may dig into the rich culinary traditions of Morocco at a fraction of what you would have to pay for a meal in Europe. You are, however, recommended to assess where it is safe to eat, as hygienic standards in Marrakech may be completely different to what you are used to. 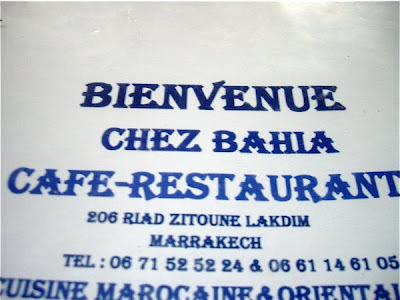 One place it is definitely safe to eat is Chez Bahia! 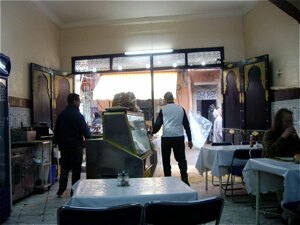 Chez Bahia is located in one of the main streets leading from Djemaa el Fna to the Kasbah area. It is a charming area from my point of view, genuinely Moroccan, a pulsating busy street with pushy vendors selling all kinds of objects onto tourists. Here you may leave the street and suddenly find yourself in charming Riads, quiet old merchants quarters often turned into hotels. 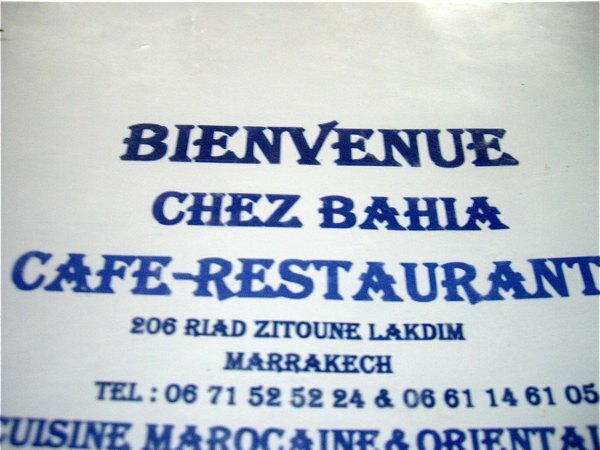 Chez Bahia is a no-nonsense place where people gather to enjoy genuine Moroccan food, tourists and natives alike. Its interior evades my rigid systems. It is not one of these restaurants with fancy decor or neatly dressed tables that may be awarded a high score. You are seated in a room, where walls are partly covered by beautiful tiles, partly cream coloured. Hardly the most stylish or comfortable place to eat, but decent, authentic and honest in any way. 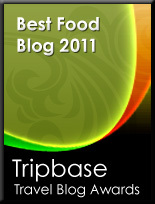 Good service from the staff, running around serving all the guests entering the restaurant. This seemed to be a popular place to eat, and provided a good living for those in charge. Tagines and more - mmmmm...........! We had to try one of their tagines - meats served in traditional terracotta pots prepared over open fire. 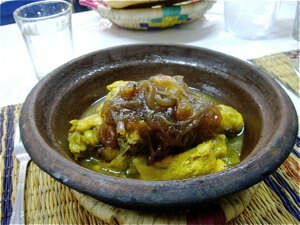 At Chez Bahia you are served mostly chicken and lamb tagines, often flavoured with fruits, honey and nuts. The terracotta pots were displayed by the street, cooking over open fire. This is genuine slow food, as meats and vegetables are allowed to stew for hours. When you open up the rustic conically shaped lid, exotic aromas fills the air and you cannot wait to tuck in. The price of the food was hardly a rip-off - 30 dirhams pluss/minus (2,50 EUR) was more or less the price of all offered on the menu. I ordered a lamb tagine, piping hot, flavoured with onion and honey, and other secret exotic spices. What salt, sweet and spicy aromas - a real taste of what the Maghreb region has to offer!! The meat was extraordinarily tender, disintegrating into thin flakes by the fork. The vegetables was soft and tender, soaking up all the flavours of the stew. The onion was sticky, and glistening with sweet honey. I would have died to have a glass of red wine, or even a beer to this exquisite food, but as in many Morrocan taverns they observe a non-alcohol policy. We ordered a bottle of chilled water, and that was as refreshing as a beer would have been. 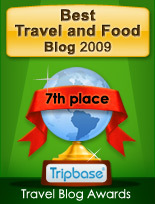 The good thing was that we did not have any other flavours competing with our food.